Silicon Valley Pride invites furs – Fangcon makes history with Pride parade sponsorship. “Furry Pride” is redundant when you’re a talking animal. There’s no way you can’t strut your stuff, turn heads and light up a crowd with smiles. 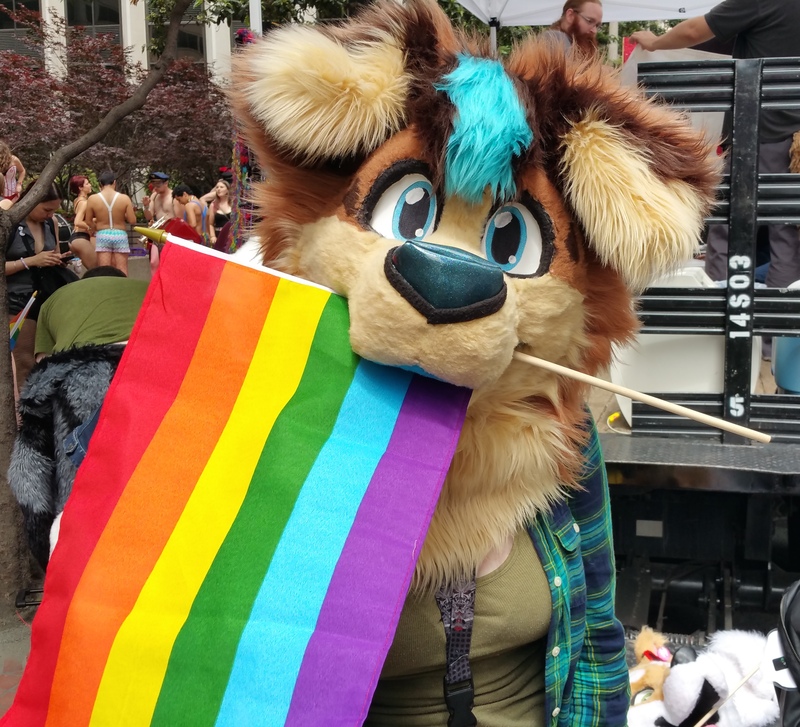 But when furries AT Pride join other groups with a bigger mission, it puts the magic where it most belongs – in a fabulous show – and makes a good cause better. “Silicon Valley Pride has reached out to me as they would love to have fursuiters at the pride festival, August 30th. They will have a changing tent available, and can offer free admission for suiters that RSVP in advance. The other person who they reached out to, who’s coordinating things right now, is Lani B. She’s pretty active in the South Bay cosplay scene, and they’ve reached out to her to get cosplayers to go as well. (Anime/comic type costuming stuff). Her email is dynamiccosplaycouple@gmail.com and she’s on facebook here. The 42nd anniversary of San Francisco Pride happened this weekend. People from all over the world filled the city to celebrate. It was too large and fabulous for words, so I can only personally comment about fursuiting at some street parties. There was no organized furry event or mission, just a good opportunity to wear a costume. The last organized furry participation was a float in the 2005 Pride parade, arranged via BAF and its mailing list. (I heard that there was some negligible drama about connecting furries + LGBT, but it stayed internal, with positive reactions elsewhere.) Due to logistics and cost, it hasn’t reoccurred.